The major uncertainty in those discussions is how to handle a request by Oconee County Chief Superior Court Judge David Sweat for $25 million in SPLOST funds for a new courthouse or judicial facility. At its last discussion of SPLOST priorities–at a called meeting on March 3–Commission Chairman Melvin Davis proposed that no money from SPLOST 2015 be used for a new courthouse or judicial facility. Instead, he proposed, all offices other than judicial ones should move out of the existing courthouse, and the county should use $2.7 million in unspent funds from SPLOST 2004 to make over the existing courthouse as a strictly judicial facility. Mayor Charles Ivie introduced the resolution on Wednesday evening on behalf of Watkinsville Council member Brian Brodrick. Protocol requires the mayor to bring resolutions before the body for action. “The City Council of Watkinsville understands that local judicial leaders and members of the Oconee County Commission are examining a number of options related to the future of the Oconee County Courthouse and office space for various county offices,” the resolution states. The resolution notes that while court facilities need to remain within the county seat of Watkinsville, administrative offices do not. Council member Connie Massey was absent, but the resolution was approved by Brodrick, Marci Campbell, Mike Huff and Mike Link. I did not attend the meeting. City Clerk Julie Sanders gave me notes on the meeting and a copy of the resolution. The county has released a revised timeline for meetings leading up to the Nov. 4 vote on the 1 percent SPLOST referendum. The first meeting with the public will be at 6 p.m. on April 28 at the Civic Center on Hog Mountain Road. 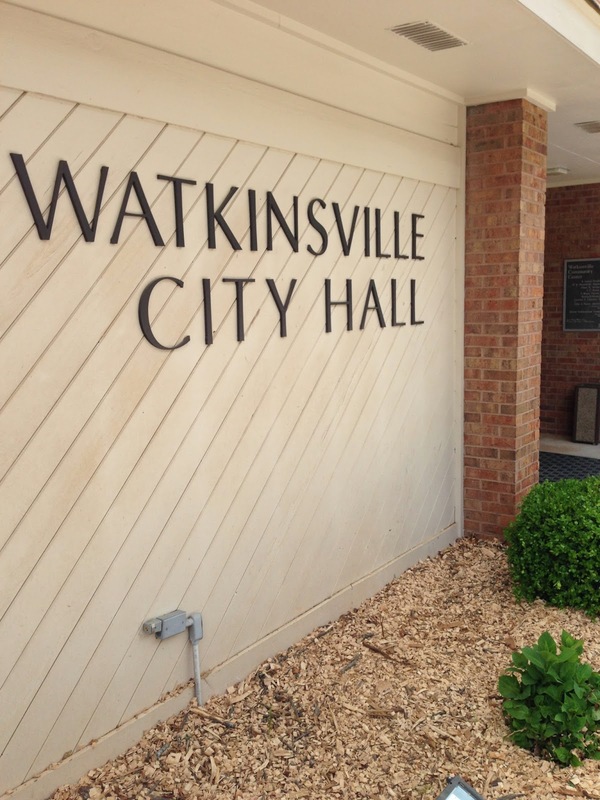 The second public meeting will be at 6 p.m. on May 12 at the courthouse in Watkinsville. The Commissioners will meet in a work session on May 21, probably at the courthouse, to reach a decision on which projects will be placed in the language of the referendum. The Commissioners will discuss that list at their meeting on May 27 and approve it at their meeting on June 3. The Commissioners voted to put the issue on the ballot in November rather than in May because they could not agree on the priorities for the referendum. The courthouse was one of the unresolved issues. If the County decides to go forward with the plan of Davis to turn the existing courthouse into a strictly judicial facility, a number of existing offices must be relocated. Tax Commissioner Jennifer T. Riddle has her office in the courthouse. So does BOC Chairman Davis, Administrative Officer Jeff Benko, City Clerk Jane Greathouse, Finance Director Wes Geddings, Economic Development Director Rusty Haygood, Information Technology Director Paula Nedza, Director of Strategic & Long-Range Planning Wayne Provost, Chief Appraiser Allen Skinner and Human Resources Director Malinda Smith. Other offices are spread around the city, with Code Enforcement and the Planning Department located across the street from the courthouse in what is called the Courthouse Annex. The Health Department is on Experiment Station Road. The Utility Department and Public Works Department are in the Government Annex on SR 15 in the Watkinsville industrial area. The Board of Elections is in its own building next door to the courthouse. In recent years, the BOC has discussed a number of plans for consolidation of county offices, including in a renovated Government Annex building. That option has been limited by the decision of the Commissioners to give a 10-year lease to the United States Department of Agriculture for office space in the building. No sidewalks run along SR 15, and walking to the Government Annex would be a rather unpleasant experience. The BOC, the Industrial Development Authority, and the Planning Commission all use meetings rooms in the present courthouse, and those would have to be provided in the Government Annex or elsewhere if the courthouse is turned over to judicial functions exclusively. Architect Robert Smith, who grew up in Oconee County, has presented in a pair of meetings his vision for new government facilities that includes a common green running from the existing courthouse to a new government multi-purpose building east of Rocket Field in Watkinsville near the current offices of the Oconee County school system. The first of those meetings was held in the Watkinsville Community Center, and Smith was introduced by Council member Brodrick. Smith’s plan focused on a stretch of green space at the center of downtown Watkinsville and the ability of people to walk comfortably between government buildings. The proposal has not been referenced by the Board of Commissioners as they discussed plans for the existing courthouse. I have uploaded a video of the five-hour-long March 3 meeting to the Vimeo Channel for Oconee County Observations. The video is in three sections. Part 1 covers requests from law enforcement, fire rescue and Public Works. It also covers discussion of the courthouse and libraries. Part 2 consists of discussion of the request from the Utility Department. Part 3 includes discussion of requests from the Animal Shelter and the coroner. It also includes discussion of facilities projects, library projects, Parks and Recreation Department requests, the Civic Center, the Industrial Development Authority request, judical courts technology, the judicial building, the Georgia State Patrol Post request, farmland protection, and historic preservation and scenic facilities. The glaring tucked-away fact is that 2.4 million dollars remains unspent from 2004. Talk to a commissioner and he or she will immediately boast about the mill rate not changing.